The Madding Crowd research and perform the church and secular music of the English village bands and choirs in the period 1660 to 1861. The Madding Crowd and friends, all lovers of West Gallery music. This partnership event is organised by The Madding Crowd. The Madding Crowd is one of the largest and longest established of the revival groups specialising in West Gallery music, meeting each week, just as the old gallery bands and choirs did. 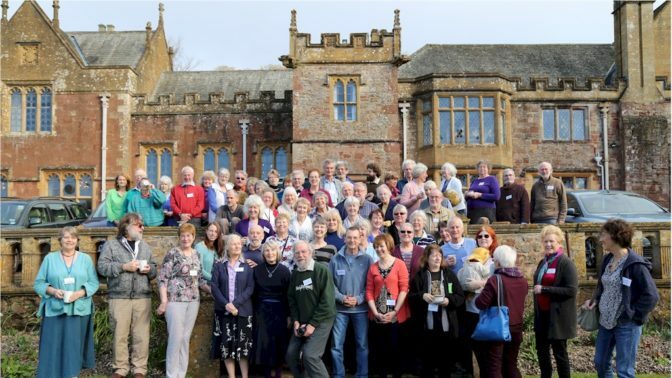 The group was founded in 1975 to lead a village evensong, and we have given carol concerts every year since 1977, summer concerts since 1979, harvest concerts since 1989, and have led the singing at many church services, baptisms, weddings and harvest festivals. We have broadcast on radio and television several times, including the Songs of Praise programme shown in 1990, and in “Going the Rounds” on BBC Radio 4 in December 2003. We also provided music for a television programme about Isaac Watts, shown on the PAX channel in North America. In the 1990s we created an early 19th century village wedding and celebration for English Heritage Special Events at various locations in the South of England.